Clay Aiken – Gearing Up For The Tour! Erik R. Caban is a writer for a news site titled Watermark Your LGBT Life. Daily. The very popular site makes its home in Florida and covers current news, arts and culture and even a section on living. 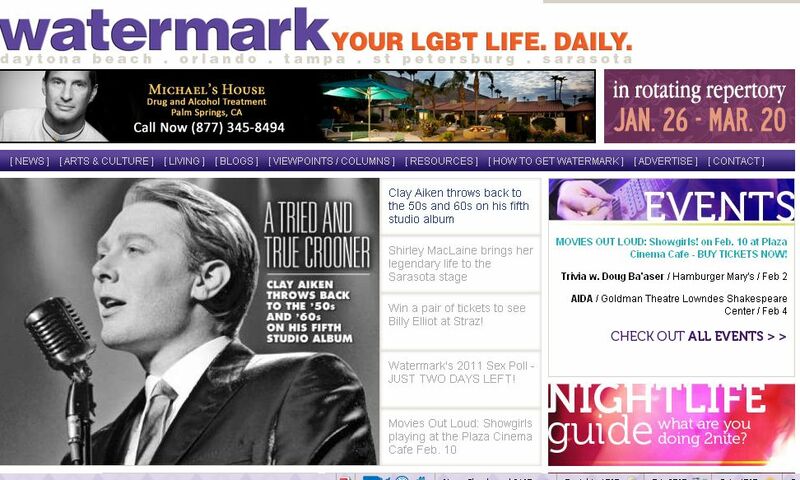 On Thursday, February 3rd, Erik published a wonderful interview with Clay Aiken. Erik seemed to find some thought-provoking questions that allowed the reader to get to know Clay just a bit better. You can tell by the first paragraph that this interview is worth a good read. “In a day of reality-show instant celebrities, still only a select few know the exhilarating feat of being plucked out of anonymity and thrown into the proverbial fishbowl of super-stardom. 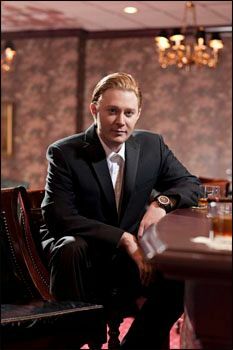 Clay Aiken was a fan favorite during the sophomore season of American Idol, where he finished second to Ruben Studdard. You can read Erik’s interview at Watermark. And, don’t forget to leave a comment. Comments are a way of showing the author that you enjoyed his writing and hope he will write more about Clay. It’s the best way to say Thank-you!! Performing in Atlanta has been special for singer Clay Aiken. It’s not his birthplace — that would be Raleigh, N.C. — but he feels partial to the city. “I auditioned for ‘American Idol’ in Atlanta so it’s full circle when I return,” says Aiken, who brings his “Tried and True” tour to the Cobb Energy Centre on Feb. 16. Aiken was featured on the second season of “American Idol,” where he eventually was runner-up to Ruben Studdard. On the show, he was an audience favorite, never once appearing in the bottom three for viewer votes. It helped him, he feels, that he was able to sing songs he was familiar with. This well-written article is a great read. Now, don’t forget those comments. The Gaston Gazette is a news site in Gastonia, North Carolina. Bernie Petit wrote up an article and interview with Clay. He mentioned the other Idol finalists from North Carolina and made sure that the readers knew about the Tried & True Tour stop in Charlotte, NC on February 23rd. The following paragraphs are a great tease for the article. It’s produced Season 3 winner Fantasia Barrino and Kellie Pickler and Chris Daughtry, both of Season 5. This year, Tar Heel singers Scotty McCreery of Garner and Victoria Huggins of St. Pauls were given the coveted golden ticket to Hollywood on the show. You can read the entire article at GastonGazette. And, don’t forget those positive comments. According to an announcement on Clay Aiken’s Twitter and FaceBook accounts, the winners of the Official Fan Club Meet & Greets have been selected and the winners were notified via email. Did you get one of those special emails? I didn’t, but then, I had a meet & greet during the Timeless Tour. It was time for someone else to celebrate! A poster from Clays Official Fan Club ask that the following information be posted on as many Clay boards as possible. The following is the information she wanted all of us to know. On Friday, February 4th, Clay Aiken will be interviewed on a small, non-profit radio station in a small town about 10 minutes from Waterbury, CT. It seems the station has been playing songs from Tried & True each day. On Thursday, after playing Mack, The Knife, they announced that Clay would be at the Palace Theatre and that they would be talking to him on Friday. The station started streaming in December of 2010. It is strictly a non-profit station and does not play any commercials. Great articles musicfan! I've read them all and I love the writeups! Keep em coming! Thank you for posting the links to these positive articles in one place. It's so important to give the authors of these articles/interviews comments and feedback. Leaving a comment and retweeting the articles helps them, and in turn, they will write again about Clay. Wonderful and truthful articles on Clay…It truly is wonderful to read all of these. We have known all along what a great person Clay is, and I am thrilled that people that don't know these things about him, are being informed… The media seems to focus on all the bad out there….when things like what Clay does, his humanitarian efforts, go completely un-noticed. Can't wait to see Clay next week on tour….He is such a fantastic performer. Love all the positive articles, and can't wait to see Clay Aiken in Tried and True concert in Mesa Az. Wow! A mountain of wonderful articles about our guy Clay. Thanks for finding and posting them for us, his fans. I tuned in to listen to the interview at 5:00, but Clay wasn't on. I love reading all the positive press. These people believe in telling the truth about Clay. Will be seeing him in just 6 days. What a joy to see all the positive press Clay is getting now days. It is about time. Error: Error validating access token: Session has expired on Tuesday, 21-Aug-18 16:13:01 PDT. The current time is Friday, 26-Apr-19 01:08:57 PDT.